HiveFleetAbyss had the most liked content! Xbox 360, car tinkering, warhammer 40K model painting. Apparently it's something to do with the dry solders in the mechanism. From what ive heard easy fix (just needs resoldering) mines been doing it for 12+ mths now and I'm more surprised when it works. I've got to the point I just ignore it. Best Nistune/e85 Tuner In Seq? Another option is Deren at Tuned Performance at Virginia if your willing to make the drive. He is a certified nistune dealer. Have you got 33 S1 front grille? Spotted White 33 #plate 151JKR at KFC Deagon yesturday, gave him way and exchanged waved have SAU sticker on window. Unfortunately no wasn't me. I was under my car all day yesterday. Did the factory front grill by any chance cheat death? 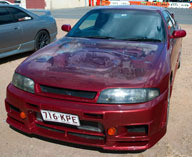 Series 2 R33 parked in Morayfield Jaycar car park. #plate 165 IJO. Spotted NHR34 in his silver 34 heading back to bribie as I was going out of bribie.